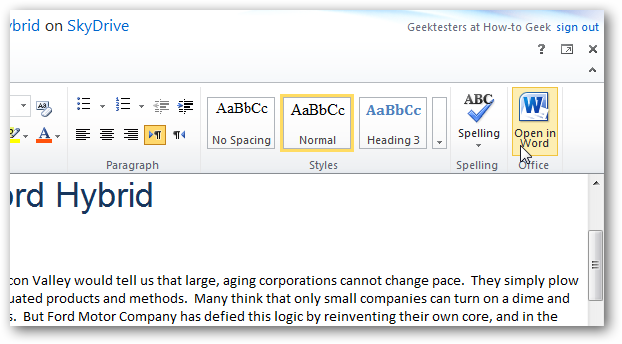 Would you like to edit your online documents in Office 2010 or 2007 instead of in the Office Web Apps? Here’s how you can edit your documents offline and still take advantage of the online collaboration offered by the Web Apps. 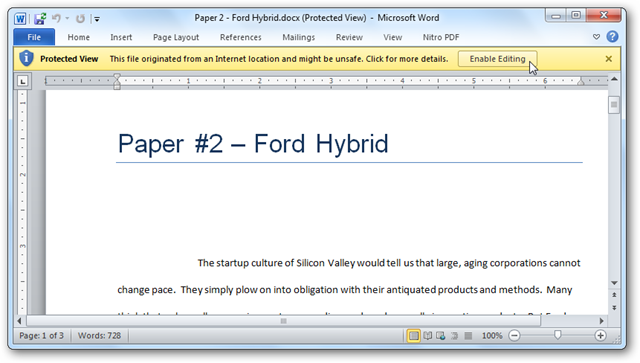 The Office Web Apps are a great way to preview and edit your documents in your browser. With 25Gb of free storage online, the new online Office is a great way to share and collaborate with others on your documents. But even if you don’t like editing your documents online, you can still make use of the web apps. Simply view your document online, open the File menu in the app, and select Open in Word. Alternately, if you’re already editing the document in your browser, and then realize that you’ll need more advanced Office features than the Web Apps offer, you can click Open in Word in the Web App’s ribbon. Click Ok to confirm that you trust the document and want to open it. 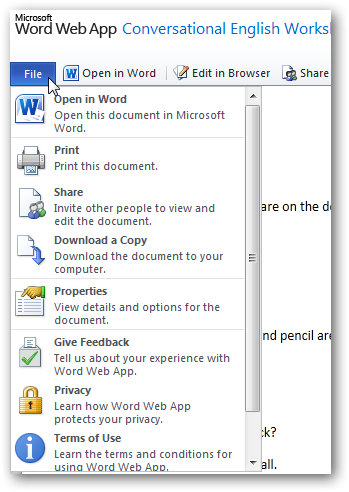 The appropriate desktop Office application (Word in our case) will then open and download the new file. 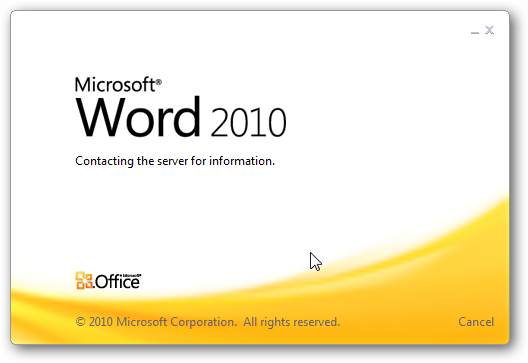 If you’re using Office 2010, you will notice that it says it’s contacting the server for information; Office 2007 will simply seem to take longer opening than usual. If this is the first time to edit Office Web Apps documents in Office on your desktop, you may be asked to sign in before you can see the file. 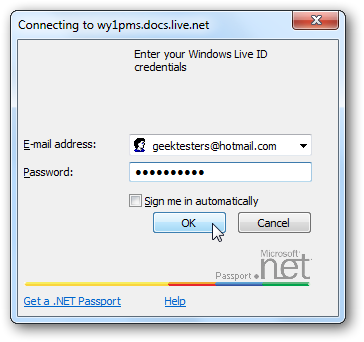 Enter your Live ID that you used with Office Web Apps to continue. 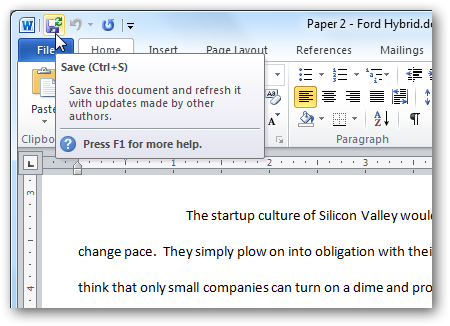 Now you’ll see your document open in Word on your desktop, or another Office application depending on your document you opened. By default, Protected View will prevent you from editing the document since it originated from an online location. Click Enable Editing to edit your document as you need. Now you can edit your document fully in Word on your desktop, and use any features available, even if these aren’t supported in the web apps. This works great in both Office 2010 and 2007, which is nice. You may notice that your save icon now has arrows in the top right corner. This shows that when you save the document, it will actually save to your SkyDrive where you can view changes and preview the file online. Additionally, anyone you’ve shared the document with will now see the updated version, even though you updated the document offline. Note: Saving changes to a document may take somewhat longer than usual depending on your internet connection speed. If you’d like to save a local copy of the file, open the File menu or click the orb in Office 2007, and select Save As. Now you can save the file wherever you’d like on your desktop. In our tests, we did discover a few problems with offline editing. 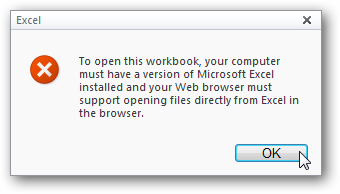 First, Office Web Apps only support IE, Firefox, and Safari. Even though the apps work fine in Chrome, we were informed that our browser wasn’t supported when we tried to open a file to edit offline. You may encounter a similar problem if you use an alternate Office suite such as OpenOffice.org. Some of the web apps, such as Excel and OneNote, allow you to simultaneously edit a document with others. However, when we tried to open the file in the Office application on our computer, the Web Apps warned us that we cannot edit documents offline and online at the same time. If you want to collaborate, you’ll have to work in the browser. If you encounter these problems, browse to the document on SkyDrive, click More, and then select Download. If you want to save the changes you made back to your Office online, simply save the document in Office as normal and then upload it again to SkyDrive. The Office Web Apps are a promising start as an online collaboration suite from Microsoft, but the web apps are still lacking compared to full-featured Office on your desktop. Since you can still easily edit the documents offline and then save the changes back to SkyDrive, though, they are still very useful. Hopefully some of the kinks will be worked our shortly and more browsers such as Chrome supported, but until then, this info should help you be able to collaborate with the web apps no matter what software you use.